To research the history of navigation and sailing vessels of the Sixteenth Century. To construct, maintain and operate a replica of a Sixteenth Century sailing vessel. To develop the educational and cultural aspects of the vessel; interpret and disseminate that information to the public through special programs, exhibits or related activities. To disseminate information about the constructed vessel and early English settlements in America. To exhibit and display the constructed vessel at public functions and events for educational, cultural and historical purposes. 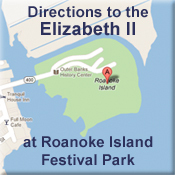 To act as the non-profit arm of Roanoke Island Festival Park and to advise the Executive Director on matters pertinent to the development and operation of the site. To publish, acquire, dispose of and rent property or real estate, and any other materials and equipment to enhance its goals.